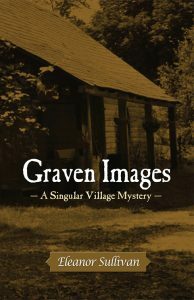 Graven Images is the second in a series of historical mystery novels, published by Yesteryear Press. The graphic treatment for this new book would be easy—match the first book cover: a photo with a dark color overlay. But the key to all book covers is the image… design concepts based on the story. The first design concept was an early American primitive portrait painting, which was part of the story. I teamed up with author, Eleanor Sullivan, and we scrounged the Web for images to use. We even considered hiring an artist who paints in that particular style, and would own all copyrights to the painting. Nothing seemed right. Instead, we looked through the author’s personal collection of photos (from historic Zoar Ohio). There were several good possibilities, but the best was a cabin. Although the cabin wasn’t the main focus of the story, it represented the heroine’s home. I enlarged and cropped the photo. After testing several overlay colors, I choose dark gold—a rich tone and a complementary color to the first book. A book series also has common design elements: the same fonts, placement of logos and type. The title and subhead were set in Caslon Antique and were placed toward the center of the cover, in the darkest area. The author’s logo was added at the bottom of the page, this time in dark gold. The final design is a pleasing companion to the first book. Talk to N-K Creative about designing your book. Contact 314-548-6001. You did a great job on Eleanor Sullivan’s Graven Images. The cover is beautifully designed and perfect for the content. Text is readable and visually appealing. Congratulations!